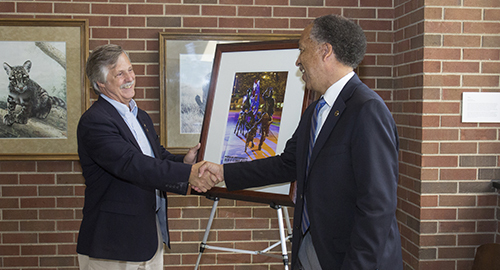 Dean Willie Reed congratulates Dr. Pete Bill after presenting him with a framed print of the Continuum sculpture during a reception in honor of Dr. Bill’s retirement. Dr. Bill is a Purdue Veterinary Medicine alumnus who earned his DVM degree in 1980 and then entered private veterinary practice as a small animal practitioner. He also started teaching at Indiana University/Purdue University at Indianapolis (IUPUI). In 1985, he received his MS degree from IUPUI and returned to Purdue’s West Lafayette campus as a graduate instructor and David Ross Fellow in the College of Veterinary Medicine. He earned his PhD at Purdue in 1990 and became a visiting assistant professor of clinical pharmacology and assistant to the director of the College’s Veterinary Technology Program. 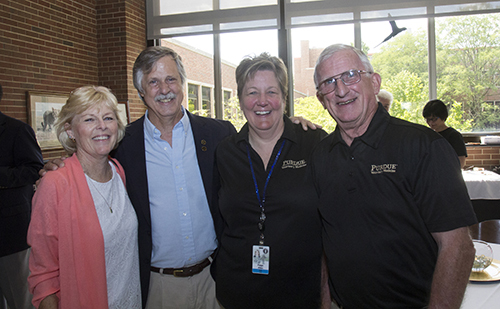 Dr. Pete Bill with Veterinary Technology Program colleagues (left-right) Sue Sanders, Paige Allen and Harry Latshaw. Two Veterinary Technology Program alumni have started on a mission to endow a named scholarship in honor of Dr. Bill to assist veterinary technology students. The fundraising goal to endow The Dr. Robert “Pete” Bill Veterinary Technology Scholarship in the College of Veterinary Medicine, enabling the fund to continue in perpetuity, is $25,000. Click here to contribute now or contact Tanya Finkbiner at 765-494-5032 for more information. 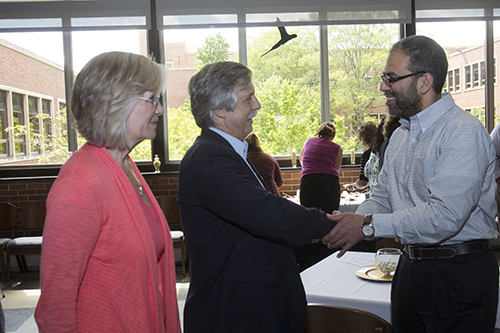 Dr. Pete Bill is congratulated by Dr. Mohamed Seleem, associate professor of microbiology in the Department of Comparative Pathobiology.